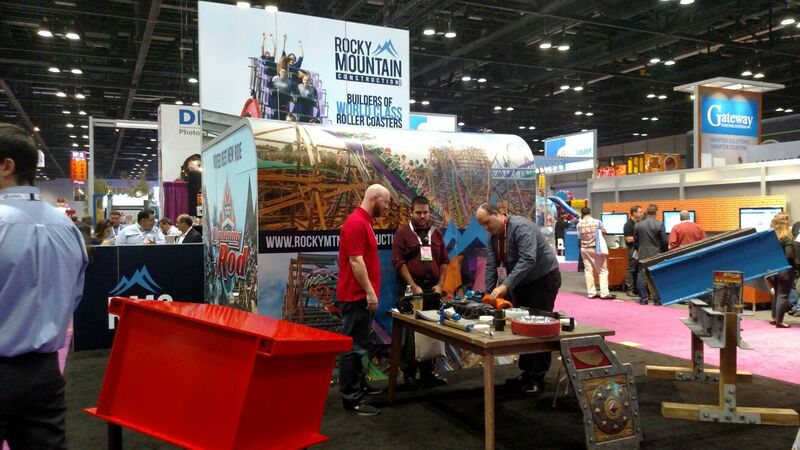 Highlights from the second day of the IAAPA Expo 2016 at the Orange County Convention Center included a new go-kart track to built in Florida, new Motion Theater rides from Simworx and Dynamic Attractions and news of a record breaking conference attendance! Join in the discussion on the CoasterForce forums. Read our Highlights from Day 1. IAAPA Attractions Expo 2016 has been the largest ever in terms of buyer and exhibitor numbers! Andreitti announces the opening of a 164,000 square foot location in Orlando for 2017. Located behind the Convention Center, this is their first expansion outside of Georgia. The two respected ride companies have joined forces top create the world’s first 360° Rotating Flying Theater. More information on the Simworx website. This cool model of Skyline Attraction’s SkyWarp ride shows how it will work. Imagine along train slithering around a vertical, sideways, slightly squashed figure of eight track. Read more on the IAAPA website. More from the show floor tomorrow!